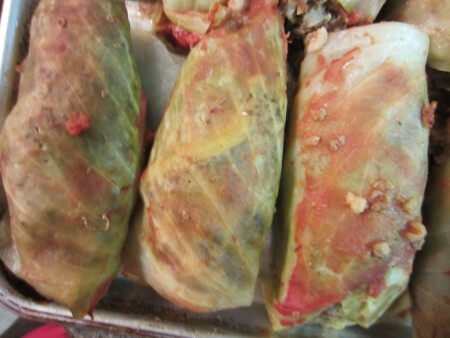 Here is a delicious and nutritious recipe for Cabbage Rolls. I used brown rice and then added the buckwheat too. Besides the onion, I have added 4 teaspoons of dried leek powder. That is entirely optional. I just like to add some of the garden veggies or herbs I have turned into powder and frozen. I could have also added some parsley or basil powder. This is just added nutrients! I used half of the cabbage head and shredded the rest to freeze loosely in plastic bags for soups. This morning I took out a 6 pound head of cabbage; I thought I would turn it into sauerkraut. For my birthday I got 2 books on mastering fermentation and I thought I would try a new recipe. I made changes to my recipe as above and now I have a new healthier recipe to share. Thaw the beef & cook the rice and buckwheat together in the water until almost done; then allow it to cool. Cut about 2 inches out into the core of the cabbage head. Prepare the leaves by simmering the head in a covered pot with a few inches of water. As the leaves get limp but not fully cooked, remove them and continue to do this until you have enough leaves. (I used 14) Cut each leaf in half. Set them aside. Chop the onion fine. Mix the beef, rice mixture and onion together. Place about 3/4 cup of the beef mixture on each leaf and roll up. Place them all in a large roaster in 2 layers. Pour the tomato juice over and bake at 325 º F for 2 hours. Remove from oven, serve & enjoy as many as you will need! Melvin & I are enjoying them for our New Years Eve supper! I will be freezing most that I made today by placing them on cookie sheets. Once they are frozen, I put them into plastic bags & keep them frozen. That way I can remove as many as I want at another time from the freezer. I am excited that I will have a quick meal on hand when the kids or others stop by.